Ammonium nitrate is a common chemical substance with a plenty of industrial uses and you can take more benefits from it than you think. 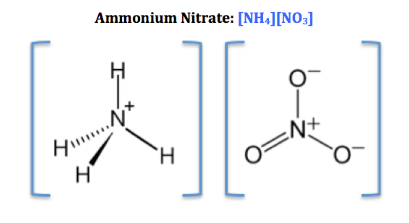 Here, we will discuss the ammonium nitrate formula and its uses too. You must have heard of this chemical substance during your school days and experimented in chemistry labs too. This is typically a white solid and highly soluble in water. It is available either in the crystalline form or a bead form too. Would you like to explore the physical appearance of ammonium nitrate too? Well, the chemical formula for the substance is NH4NO3 with two nitrogen atoms, four hydrogen atoms, and three oxygen atoms.it contains two ions too, one is ammonium ion (NH4+) and the other is nitrate ion (NO3-). The bond present between two ions is an ionic bond. The most common uses of Ammonium nitrate are fertilizers and the explosives. It helps in photosynthesis process for growth of a plant. It is majorly used as the fertilizer and an important part of our agricultural industry. The best part is that ammonium nitrate is available at very manageable costs. Further, it is used in manufacturing explosives and an oxidizing agent for the fuel. It can be used in mining industries too because of its availability, low costs, stability etc. It is available in improvised explosive devices too and named as the homemade bombs. The concept is not new but it is a common part of the study during high schools.